Selecting the right Realtor is a bit like finding a match on a dating app. If you’re smart, you don’t just randomly go after the first fish that nibbles on your line. You do your homework—look for common ground, see if you communicate well, determine if you trust this person and if the relationship meets your needs. With over 1,200 active real estate agents currently serving the Lowcountry, why settle? 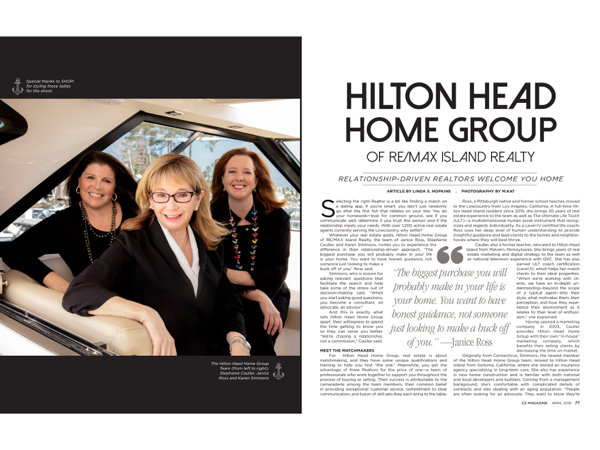 Whatever your real estate goals, Hilton Head Home Group of RE/MAX Island Realty, the team of Janice Ross, Stephanie Cauller, and Karen Simmons, invites you to experience the difference in their relationship-driven approach. “The biggest purchase you will probably make in your life is your home. You want to have honest guidance, not someone just looking to make a buck off of you,” Ross said. And this is exactly what sets Hilton Head Home Group apart: their willingness to spend the time getting to know you so they can serve you better. “We’re chasing a relationship, not a commission,” Cauller said. For Hilton Head Home Group, real estate is about matchmaking, and they have some unique qualifications and training to help you find “the one.” Meanwhile, you get the advantage of three Realtors for the price of one—a team of professionals who work together to support you throughout the process of buying or selling. Their success is attributable to the camaraderie among the team members, their common belief in providing exceptional customer service, commitment to clear communication, and fusion of skill sets they each bring to the table. Ross, a Pittsburgh native and former school teacher, moved to the Lowcountry from Los Angeles, California. A full-time Hilton Head Island resident since 2015, she brings 30 years of real estate experience to the team as well as The Ultimate Life Tool® (ULT)—a multidimensional human asset instrument that recognizes and regards individuality. As a Level IV certified life coach, Ross uses her deep level of human understanding to provide insightful guidance and lead clients to the homes and neighborhoods where they will best thrive. Cauller, also a former teacher, relocated to Hilton Head Island from Malvern, Pennsylvania. She brings years of real estate marketing and digital strategy to the team as well as national television experience with QVC. She has also earned ULT coach certification (Level II), which helps her match clients to their ideal properties. “When we’re working with clients, we have an in-depth understanding—beyond the scope of a typical agent—into their style, what motivates them, their perception, and how they experience their environment as it relates to their level of enthusiasm,” she explained. Having opened a marketing company in 2003, Cauller provides Hilton Head Home Group with their own “in-house” marketing company, which benefits their selling clients by decreasing the time on market. Originally from Connecticut, Simmons, the newest member of the Hilton Head Home Group team, moved to Hilton Head Island from Sonoma, California, where she owned an insurance agency specializing in long-term care. She also has experience in new home construction and is familiar with both national and local developers and builders. Coming from a management background, she’s comfortable with complicated details of contracts and also dealing with an aging population. “People are often looking for an advocate. They want to know they’re making the right decision. I have a really good understanding of the community and know what to look for and how to negotiate,” she said. She recently earned the RENE (Real Estate Negotiation Expert) certification. “I always say we’re a funny joke,” Cauller said. “The Jewish woman, the Italian woman and the Irish woman walked into a bar…” There’s no punch line, but it is their diversity of cultural, generational, career and life experiences that makes them a strong team. “There’s really good mojo between us, and I think the clients can tell that,” Simmons said. In addition to their professional credentials, compatibility, and sense of humor, a key to the team’s effectiveness is knowing when and how to communicate with clients. “Our goal, as a group, is to provide the exact level of service you need without being intrusive and with the utmost respect for your privacy,” Cauller said. “We’re cognizant of our clients’ privacy—especially clients who are just getting started in their real estate search.” You can sign up on their website and share your contact information with confidence that you will be served, not pestered. Furthering their media presence, thanks to Cauller’s television and marketing savvy along with the team’s persistence and drive, Hilton Head Home Group will be appearing on an HGTV episode of Island Life, airing in May (check your local listings). All three team members at Hilton Head Home Group are here to stay and take pride in serving our community. Collectively, they have held volunteer positions with The Arts Center of Coastal Carolina, Hilton Head Island School for Creative Arts, Volunteers in Medicine, TEDxHiltonHead, Girls on the Run of the Low Country, Island Academy of Hilton Head, The Island Recreation Center, Memory Matters, and others. Hilton Head Home Group of RE/MAX Island Realty has offices on Hilton Head Island, in Bluffton and in Sun City. For more information, visit www.hiltonheadhomegroup.com or call (843) 415-7738.